Some people can do without certain amenities while RVing, whether it be internet access, cable TV, or even air conditioning you can learn to adapt. One amenity that is critical for an easy time on the road is the RV refrigerator. The RV refrigerator can be a bit of a headache, from doors swinging open, to food spoilage to keeping everything level. With some proper planning and execution, you can learn to keep your food cold, your refrigerator happy and your stomach full. Here is some advice on keeping your RV refrigerator and its contents in working order. First things first, if you have an absorption refrigerator you need to make sure it remains level always. Unlike the refrigerator in your home, an RV refrigerator can be influenced by outside weather conditions so you need to make sure you keep an eye on the internal temp if the weather is at extremes. This may include turning to your lowest setting during the hot summer months and warming things up if the outside temperature is low. The key to keeping your food fresh is to make sure there is a nice constant flow of air throughout the refrigerator. The air needs to flow through the refrigerator so it’s recommended to allow space between any items and the refrigerator’s cooling fans. Pro Tip: Consider buying fresh fruit, veggies and even meat, poultry, and seafood locally when you reach your destination. Not only will you help a local business out, but you’ll also save space in your refrigerator and won’t have to worry about spoiling. It also helps if your items are not packed together too tightly. Packing tightly will allow the items on the outside to remain cool but items towards the center can grow stagnant and even warm, causing spoilage. If you feel that your refrigerator isn’t up to keeping everything nice and cold you can supplement with extra cooling fans rather than having to purchase a new refrigerator. Space your food items evenly throughout the interior of the refrigerator, aim to put heavy items towards the bottom with lighter items hanging out around the top. This way if there is any shaking, rattling or rolling on your trip the heavy items are less likely the crush the lighter items. As with loading up your refrigerator at home, take care when loading produce into the refrigerator. Wrap tender vegetables and fruit in paper towels and in Ziploc bags to help keep them at their freshest throughout your trip. Make sure no heavy items are likely to fall onto your precious produce. 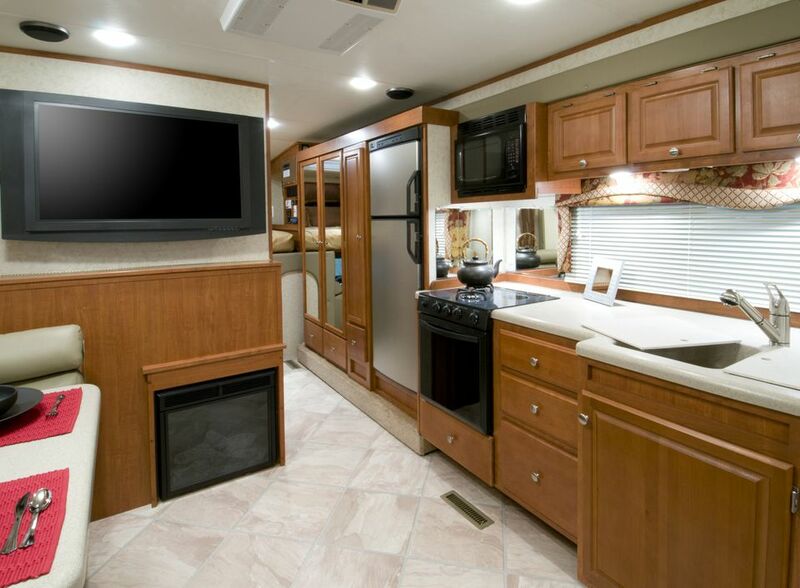 RVers can get frustrated when the doors of the refrigerator keep popping open, spilling out food, wasting power and possibly making food inedible but your delicious goodies don’t have to suffer a fate on the coach floor. Use RV refrigerator tension bars to help keep the door shut for good. It also helps if you only keep lighter items within the door of the refrigerator; heavier items are more likely to cause that door to swing open. Pro Tip: Depending on the layout of your RV “kitchen,” you want to use bungee cords to keep the refrigerator closed. This works to keep cupboards and storage areas closed, too, during travel. Make sure you power your refrigerator on before filling it up with food. An RV refrigerator can take several hours to get to optimal temperature so try powering on the night before you hit the road. Take some ice packs from your home freezer and put them in the refrigerator to help the process along because an empty refrigerator must work much harder to get to optimal temperature. Don’t load your RV refrigerator before it’s a safe temperature, especially if you’re getting ready to hit the road for a long drive. Your food will spoil before you arrive otherwise. Now that you’ve read some helpful hints, you can enjoy some tasty treats. Make sure you inspect your refrigerator at least twice a year to keep your food cool and your refrigerator in peak operating condition.